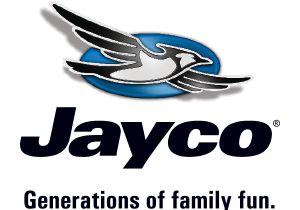 Jayco was founded in 1968 by Lloyd Bontrager, mixing Old World Amish craftsmanship and innovative technology. Jayco is now the largest family-owned and operated RV manufacturer in the nation supporting a complete lineup of recreational vehicles located in rural Middlebury, IND. Voyager RV Centre is proud to be one of Jayco’s award winning dealers since 1997 and we have the educated staff to assist you with any of your needs. Committed to quality, Jayco backs their tent trailers with five lifetime component warranties, lifter system, roof, floor, walls and bed frames. In addition to that, a 5-year tent warranty and an industry-leading 2-year warranty. Simply put, you can camp easy knowing they stand behind the product they build. Jayco has several floorplans and sizes to choose from. Some popular models in the three categories are the 10FD Jay Series Sport, 1007 Jay Series and the 10G Baja. Take a look at the Jay Flight SLX. A nice mix of 7 and 8 foot models to choose from, and layouts that sleep anywhere from 2, to 10! As with any Jayco product, they didn't sacrifice quality, these trailers light weight, Durable and all carry the 2 Year Jayco Co-Pilot Warranty. Spacious slide-outs. Check. Well-planned living areas. Check. Sleeping for up to 12. Check. The Jay Flight travel trailer continues to be America’s #1 selling travel trailer for eight years in a row. With an endless list of features, Jay Flight exceeds your family’s every wish. Jayco Jay Flights are now available with some amazing options that you don't normally see in this price category. From optional Fiberglass exterior and full foil thermal wrap to Dual Pane windows, it's easy to see why they remain in top place year after year. From the smaller 19RD and 24FBS to mid-size 26RLS to the full-size 32TSBH, Jay Flight has lots of configurations to choose from. Expand your expectations of family fun. The Jay Feather is part travel trailer, part Swiss Army knife, delivering everything you need in the ultimate expandable design. And thanks to its travel-friendly length, Jay Feather is towable by most SUVs, minivans and crossovers. The Jay Feather includes a 2-year warranty and the Magnum Truss Roof System (50% stronger than the competition) Check out the X213 for its unique rear bed slide and the popular X17Z hybrid style for more space. If tow weight is a concern, the 19XUD and 16XRB are a couple of examples from the Jay Feather SLX series that are under 3500 Pounds. The Jayco White Hawk will broaden your horizons. Thanks to 36" deep slideouts in most floor plans, White Hawk boasts twice the expandable living space of standard lightweights. And if all that width isn’t enough, expand your family time outdoors with the Summit Edition’s outside kitchen and Chil N’ Stor exterior storage. White Hawk boasts a number of family-friendly configurations so that you can make this lightweight legend fit perfect into your lifestyle. Choose from a booth dinette or a free-standing table and chairs. Then, admire the optional entertainment center with fireplace in the 29REKS or bunk beds in the 25BHS, 28DSBH, 30DSQB or 31DSLB. You'll even find the amazing space-saving Murphy bed in the 23MBH and 20MRB. Simply put, the White Hawk is built to suit any family and camping style. Jayco Eagles now pack the Jayco Climate Shield, an ultimate weather protection package that protects against extreme heat and extreme freezing. Plus, with so many standard features, like a pillowtop Denver Mattress and spacious 8 Cu. ft. refrigerator, you won’t mind staying awhile. Eagle Travel Trailers have several models with bunk beds like the 284BHBE and 314BHDS. If you're looking for more space there's options for you too, Eagle's 338RETS Triple Slide Rear Living will make you feel right at home. The Eagle Fifth Wheels have a layout for everyone - including a stunning entertainment center, dual recliners, select model peninsula-style kitchens and the 31.5FBHS front bunkroom. Jaycos North Point Luxury Fifth Wheel is impressive indeed, inside and out. From the chef inspired dream kitchen and residential-grade wood plank vinyl flooring to the 6 point electric auto leveling system and Aerodynamic front cap with LED lighting, the North Point is a must see. 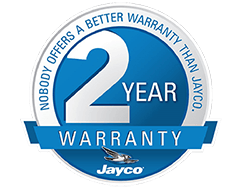 As with all Jayco products, you can feel good knowing you're covered by their industry leading 2-year co-pilot warranty. Plenty of floor plans to choose from as well, a couple of popular configurations are the 341RLTS - a comfortable rear living design, and 377RLBH - a unique mid-bunk room with a loft above. Most floorplans offer a combination of sofa bed and theater seating, thermostatic controlled fireplace, and Bluetooth/HDMI high-output entertainment system. Welcome to Luxury with the Jayco Pinnacle, the culmination of exclusive comfort and stunning design. Dressed to thrill, Pinnacle boasts a Eurostyle front cap with LED lights, Gel-360 exterior shell, and a Premium Paint option. Inside, Pinnacle exceeds your expectations. Solid-surface countertops accentuate the Culinary Dream Kitchen, while the entertainment center 40” LED HDTV (60” in the 5 slide front living room 38FLFS), and fireplace make your comfort a priority. From the walk-in closet in the bedroom to the sliding trash receptacle in the kitchen, the Jayco Pinnacle packs so many high-end conveniences, you’ll wonder why they call them standards. Venturing off the beaten path has never been this comfortable. With the Octane and Octane Super Lite, comfort meets versatility in three amenity-filled floorplans. Built to last thanks to standard fiberglass sidewalls, a vacuum-bonded garage floor (Aluminum sidewalls on the 161 Super Lite) and the Jayco-exclusive Magnum Truss Roof System, Octane is built for big adventures. The T26Y offers a front queen bed but still has 12' of cargo area for all your toys. Packed with an extraordinary list of standard features, Jayco’s most affordable Class C - the Redhawk. This motorhome is equipped with everything you need at a price you wouldn’t expect. Residential touches, like Washington Glazed cabinetry, a queen-sized Denver Mattress, and a bunk bed floorplan, deliver a step up in comfort. Meanwhile, a 305 HP Triton engine provides 22,000 GCWR with up to 5,000 lbs. of towing capacity on a Ford E-450 chassis, making the journey as much fun as the destination. Of the 4 floorplans to choose from, there is something for everyone. Bunk beds and queen bed in the Redhawk 31XL, Super Slide, and Queen Bed in the Redhawk 29XK and Corner bed and U-shaped Dinette in the Redhawk 26XS. The Redhawk 23XM offers rear slide out bed and wardrobe allowing for a full side bedroom in yet a compact size coach. The Jayco Greyhawk is ahead of its class. Loaded with more high-end features, like solid-surface countertops, a pillowtop Denver Mattress and the optional JRide Ride and Handling Package, Greyhawk delivers the best Class C value so you can ride coach in first-class style. The optional all-new Jayco exclusive JRide is packed with ride-enhancing upgrades. Many spacious floorplans to choose from including the 31DS with 2 slide-outs to the Greyhawk 31FK with a super slide, and everything in between - all designed to maximize your living space and make a better experience. Built on a Mercedes 3500 chassis with a V-6 turbo 188 HP diesel engine, the compact Jayco Melbourne makes it easy to go RV'ing without sacrificing comfort. Check out the smart space-saving designs like the two slide 24k and the full wall slide 24L. With an 81-inch interior ceiling height it's quite comfortable to move around plus utilize the Swivel driver and passenger seats for extra seating. The Jayco Alante offers amazing value with a variety of comfortable Class A motorhome layouts. With the included JRide package - the Alante is packed with ride-enhancing upgrades: Bilstein Shock absorbers, Computer-balanced driveshaft, jounce bumpers and Front and rear sway bars. While just about everything you'd expect to be optional, is standard on the Alante - you can still choose to add more sleeping space by choosing the front drop down bunk option. Powered by the popular 6.8L Triton V-10 362 HP gas engine, it's the perfect balance of style, comfort and Value. You know authority when you see it. Now, imagine what it feels like to command a little of it. Introducing the Jayco Precept, your ticket to Class A luxury. Built on an enhanced Ford F53 chassis, Precept delivers a remarkable blend of handling and comfort. Jayco's exclusive JRide package compliments the Precept with ride-enhancing upgrades. Precept features two well thought out designs, the 29UM with bunk beds, full wall slide and a rear slide out queen bed, and the 31Ul with 3 slides and a huge master bedroom. Enjoy the ergonomically designed dash and passenger computer workstation. From pass-through storage compartments to sleeper sofa with Denver mattress, Precept flaunts a whole new level of comfort. Your wait for the perfect ride is over. Meet the Jayco Seneca — our most powerful ride yet. Built on a substantial Freightliner M2 chassis, Seneca ups Class C performance with a Cummins ISB 6.7L 340 HP engine, heavy-duty rear air suspension, and a 10,000-lb. rated hitch, so you can go anywhere with just about anything. Your seatbelt should be the only thing holding you back, and its luxurious interiors should be the only thing persuading you to stay put. With king-sized beds, cab-over queen bunks and even a floor plan with bunk beds, Seneca offers a variety of sleeping arrangements to choose from.